My wife and I love the National Parks System. While we were engaged, we picked up one of the park passports which allows you to enter stamps from the different parks that you visit around the country. We’ve visited about 84 different locations in the past 10ish years, many of which we would have never known about if not for that little book. While the NPS consists of presidential homes, famous monuments, and even the birthplace of the nuclear bomb, it’s probably best known for its national parks. These locations are highly valued for their natural beauty, awe-inspiring geological features, and unique ecosystems. My wife and I loved our journey two years ago to visit the Grand Canyon, Zion, and Bryce Canyon national parks. Hiking, sightseeing, and just standing with our jaws dropped made for a wonderful vacation. So it’s great that Keymaster Games is teaming up with Fifty-Nine Parks to create a board game to celebrate some of America’s greatest natural treasures. Designed by Henry Audubon (could there be a better last name for designing a game like this? 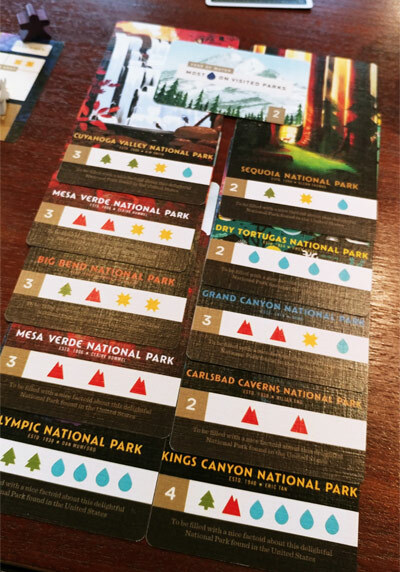 ), PARKS puts each player into the boots of two hikers adventuring on a variety of trails, represented by cards that designate different terrain. On your turn, you’ll move one of your hikers down the trail and stop at a new location that is currently unoccupied. Once you arrive, you will take the action shown on that card. Most of the actions have you collecting resources. You’ll be getting trees in the forest, sunlight in the desert, or water at the lake. Other locations will allow you to take pictures, obtain new pieces of equipment, or visit one of the national parks. The equipment takes the form of gear and canteens. The canteens are fairly simple cards that allow you to use water tokens to get other perks. Most are essentially trading for resources, but there are some that give you other benefits, like relighting your campfire, a handy little tool each player has that allows you to land on the same space as another player. The gear cards are what allow you more opportunities to acquire points and resources. These cards take on a variety of forms, with some rewarding you for visiting certain types of parks, while others might allow you to spend fewer resources when visiting parks. Yes, all these resources have been acquired so that you can go out and visit some of the wonderful national parks. These beautifully illustrated cards all have a point value and a number of resources that you need to use to visit. There aren’t many opportunities to visit these locations, so you have to make sure that you have everything you need in order to maximize your points. After you’ve spent four rounds hiking, visiting, taking pictures, and racking up gear, the player with the most points wins! I got some flashbacks from other games during my playthrough of PARKS. Tokaido popped in my head as I was moving my hikers from left to right and hoping that my opponent wouldn’t block me from the locations that I wanted to visit. I really enjoy that mechanic, because it forces you to develop multiple plans in order to be successful and to think on your feet when your strategy gets interrupted. In Tokaido, there are many different ways in which players can earn points, to the extent that it can be a bit overwhelming for less experienced gamers. PARKS simplifies that process – while there are a few different ways to get points, you’re mostly just building a successful resource engine so that you can visit the most parks possible. This resource management sparked memories of Space Park, another game designed by Audubon and published by Keymaster that ended up on Ryan’s Top 10 list this year. That game also features some fighting to get to the locations you need to access, but it utilizes community pieces instead of each player having their own tokens, thus leading to an easier and less strategic gameplay experience. I love a game that rewards me for a solid strategy, and PARKS does that very well. I played with only two players, and the experience was great. There was enough room for each of us to be able to take at least our second or third choice on the path, and we both developed different yet successful engines to try to get the most points. It’s simple enough for a kid to learn, yet complex enough for the gamers in your life to request to play. I know I was ready for a second game as soon as our first was done. When we visit national parks, there is always a gift shop. My wife and I have made it a tradition to buy Christmas ornaments for a ‘travel tree’ that we put out every holiday, but usually, the rest of our options are pretty disappointing. Wooden instruments or toys in any location that slightly rings of historical. Postcards by the thousands. Books that you know you’ll never end up reading. 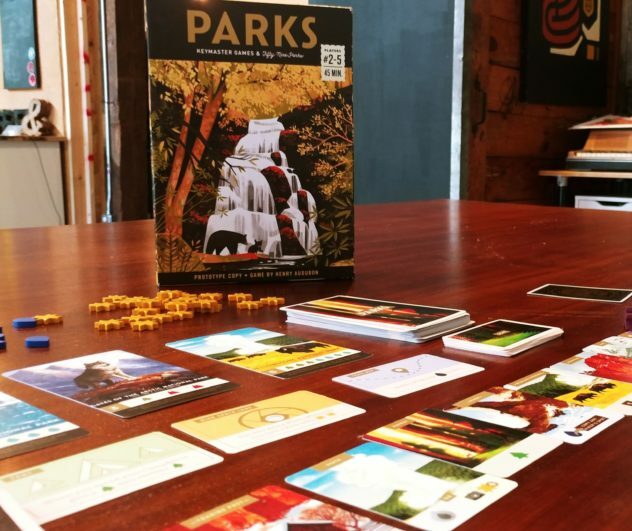 I would be excited to see a game like PARKS on the shelves of every national park and historical site because it would be a game that is actually good. This isn’t just a picture of a bear on a deck of cards, or a roll and move game where you run into a bear and have to move back two spaces, or a memory game where you have to find a picture of a bear and match it with the other picture of a bear. For those that love both games and national parks, I would categorize this as a “must buy” for you. For everyone else, I think you should highly consider PARKS. It’s a fun game with simple mechanics that leave room for a decent amount of strategy. And hey, whenever people tell you to take a break and go outside for a while, you can just play this game. It’s pretty much the same thing. The Kickstarter for PARKS begins on January 28th and runs until February 19th, so go back the project for your own copy today. You can check out a quick look at the game with Mattox Shuler over on our YouTube channel!